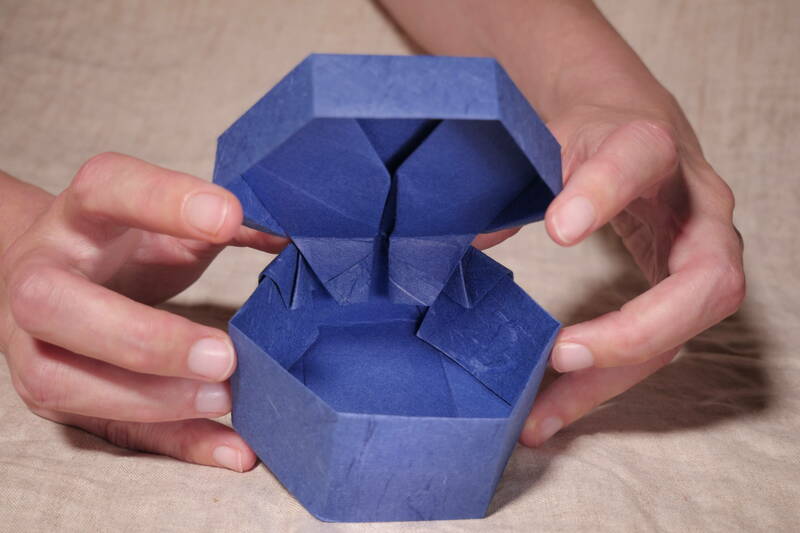 One of the reasons I love origami is that I love paper. I always did. I enjoy admiring the patterns, and I love the texture of different papers in my fingers. When I find new papers to fold, it generally doesn’t go well at first – I love when my fingers suddently understand the precise resistence and strength of the paper, when I adapt the folds to allow for the exact thickness of the paper ; when the perfect model to let the designs be admired pops to my mind. Origami is full of enlightenments. Concrete, material, my-hands-have-grasped-this revelations. I generally have a hard time getting my brain to be quiet for a while, and folding origami is a perfect way to reach that. There’s no point in over-thinking it, you have to fold to understand. One might even find spiritual, philosophical enlightenments. It does teach patience and it’s sometimes a form of meditation, relaxation or such. It’s also an art of the ephemeral: creations of paper are to be enjoyed while they last, but you know the colors will fade, or children hands will get to them, or your previously most beloved creations will seem dull, clumsy once you’ve learned new models, once your hands become more agile. And that’s not an issue, that’s the whole beauty of it: I love to give my origamis when people ask for them, it makes place for new ones, it’s a constant reminder of impermanence. 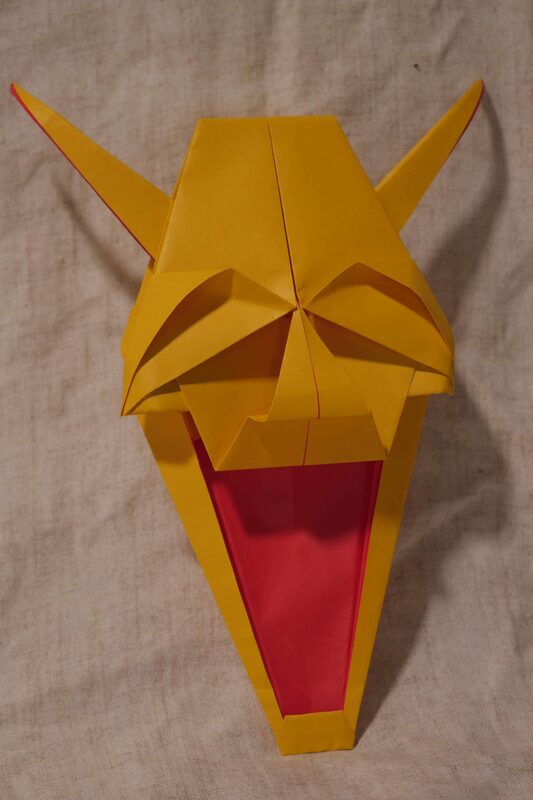 I folded it not from the paper it is sold with, but from double-sided kami paper 35 cm, to have the mouth red and colored face. The finished model is around 20 cm high. I really like his joyful smile, and the eyes are very expressive too. It’s also relatively easy to fold. *Edit: As always, Michel Grand is an attribution detective (he should get a free subscribtion to Origami Tanteidan ;)). So, we’re not absolutely sure, but this demon looks really similar to this model by Kawai Toyoaki. It might be a variation by someone else, though, as I don’t recognize the ideograms for her name on the model. 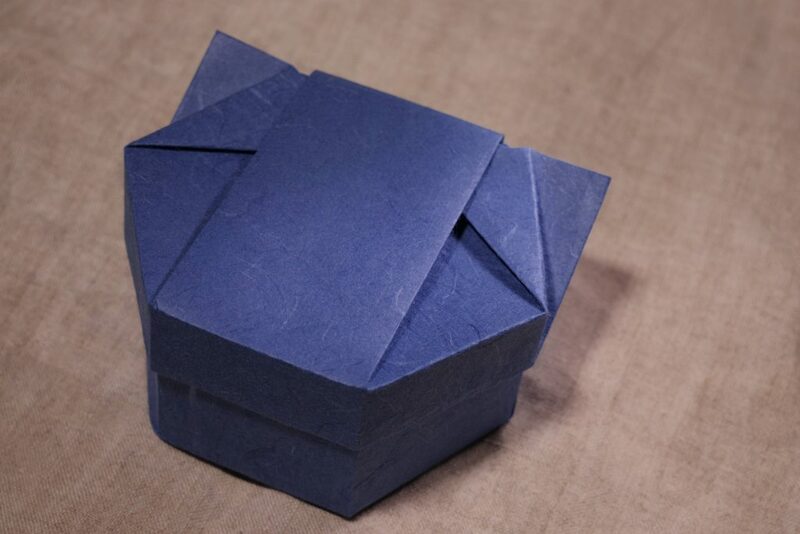 This cute cat box (or shell) by Tomoko Fusè can be found in a book in japanese, ISBN 4480872035, page 22. The box is folded of one sheet of A4 paper (the same I used on this box). Edit: correct ISBN (thanks Michel Grand!). By the way, on Gilad’s page you can see all models in the book (as you can see, the book uses paper in A format – but some work with other rectangles, too). 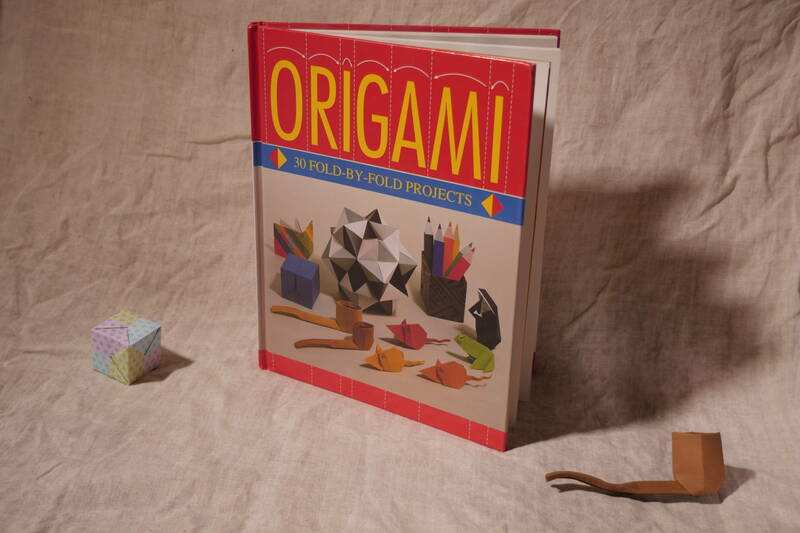 Those two very different models can be found in “Origami” by Paulo Mulathino, ISBN 0785802622 (Chartwell books inc).It is a book full of simple but cute designs. Cube folded from 6 sheets of 7 cm Senbazuru chiyogami (Grimmhobby). Pipe folded from 20 cm Heyda paper. It may not be very visible from the photo, but the pipe (page 26) is actually 3-D and really realistic.